Not impressed? 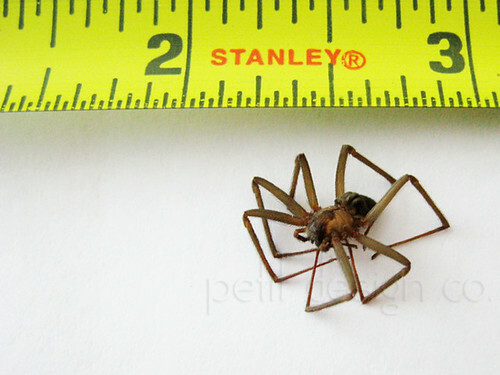 How about if I tell you that I’ve lost track of how many I have killed since moving into this house a month ago. There have been several babies, several in be-tweens and 2 or 3 of these larger ones. I’m getting so paranoid that I’m having spider dreams! OK more like nightmares. I hate having the baby play on the floor it makes me even more paranoid!!! Plus they LOVE hiding in shoes! That’s it, I’m only wearing flip flops until I’m satisfied that they are gone from the house. Have a spider free week! I know the diatomaceous earth works for fleas, I didn't know it would kill other insects or spiders (which are arachnids - not insects. ) LOL...while I was verifying my facts I found out that ticks. mites and scorpions are arachnids also. Either way, I don't want them in my house either!